Our halters have both an adjustable throatlatch and chin strap so it will fit your horse properly! How about a traditional-style halter that not only has some style, but you could easily add a bit to it? Do you have a horse that doesn't like his ears touched? Our Halter with Bit Hangers not only looks and functions awesomely, it has an adjustable chin strap and throat latch to ensure a proper fit. 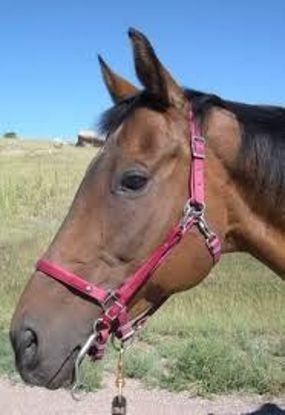 There`s nothing to pull the poll strap against your horses ears, making a nice, clean look even at the end of a hard ride. The lower rings help keep the cheek pieces out of your horse`s eyes too, and when you`re ready to ride, just snap on the bit hangers and away you go. This Halter has a traditional halter design with poll strap adjustability on the left side. Bit hangers attach higher up on the cheek, giving more adjustability for a wide array of bits.